This is Cassandra Cain taking on Steve Rogers as Cap minus shield, in a H2H combat contest. Who takes it, the WWII vet with all his years of experience in fighting and H2H or the little miniscule Cassie with her awsome H2H combat skill? i dont know they both have some pretty strong jobber auras to cancel each others out. if they were to fight in one of those speed punching contest where they keep each others hands up while facing ea other i say batgirl wins every time. Well, from what i've seen from Cass, she's very deadly, and has given Deathstroke a good run. i cant see cap beating her here by skill i firmly believe his martial knowledge will always be limited compared to actual martial artist like batgirl. the only thing letting cap compete with her is the SSS and even then it may not be good enough. 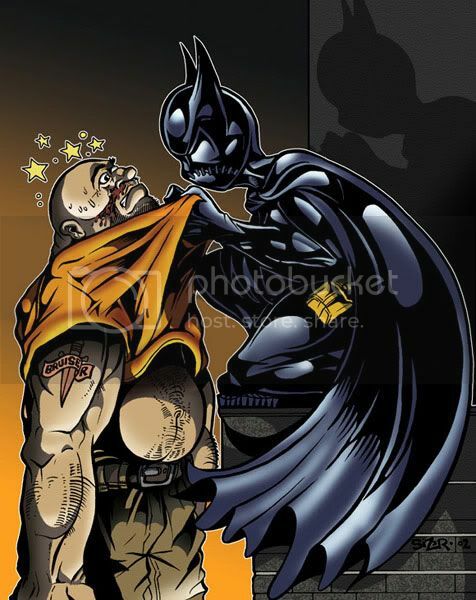 "All respect to batgirl she's a very good fighter but I can't see batgirl beating him"
I'm honestly torn! I was seriously batting for batgirl (pardon the pun) but, I find myself questioning myself now, considering how much training and experience Cap has, and especially all the years and training he had with Kang! Too close to call! Deathstroke would destroy Cap? Please tell me your kidding? I think you need some reefer to get back to reality and in touch with the rest of us! I'm happy for you to think that DS can beat Cap, as very debatable that is, cause there's room for debate, but you know some one's just being sillly when all they can say is one character annihilates the other! Your basically saying to everyone i'm not interested in hearing anything else or debating, DS annihilates Cap! I guess there's not much you can do with someone who tells you outright there not willing to debate! What a joke! Captain America is a super serum amped veteran and would beat her soundly. Yes, she will land some good hits but it won't be enough to put him out and it only takes one hit for Cap to KO her. The Cap has KOed 80 tonners like Rhino in a single move which puts him on a different level than Cain.
" The Cap has KOed 80 tonners like Rhino in a single move which puts him on a different level than Cain. " Cap wins due to having more experience.
" Cap wins due to having more experience. " Experience only goes so far. It doesn't help you hit a master martial artist that could read all of your moves. I'm almost insulted that you would laugh at his feats. You must really not like the United States or dislike Cap for personal reasons. Either way he beats your girl easily. "I'm almost insulted that you would laugh at his feats. Captain America KO'ed the Hulk, too. Doesn't make it a VALID feat. You must really not like the United States or dislike Cap for personal reasons. "Either way he beats your girl easily. " Prove it with valid showings, and I might be inclined to argue against you. I'm almost insulted that you would laugh at his feats. You must really not like the United States or dislike Cap for personal reasons. Either way he beats your girl easily. " Biased bullsh#t.He was LOL'ing because you're not smart enough to recognize PIS.Not because he's dismissing the feat for the hell of it.
" What a joke! Captain America is a super serum amped veteran and would beat her soundly. Yes, she will land some good hits but it won't be enough to put him out and it only takes one hit for Cap to KO her. The Cap has KOed 80 tonners like Rhino in a single move which puts him on a different level than Cain. " Prove it with valid showings, and I might be inclined to argue against you. " His feats may not be valid to you because you are a fanboy of Batgirl's. You do realize you have been consistently backing her against overwhelming odds, right? People obviously notice these things and that DC fetish of yours. In terms of Cap's feats, let me tell you, he accomplishes his feats because he has the heart to do so, it isn't about abilities and strength classes. Dismissing them as invalid is not the patriotic thing to do here son. Just give the veteran credit where it is due. not cool bro i dont like captain america either does that mean i hate the USA? by your logic no i dont "
If you don't like him because of his uniform or name then that might be the case. What don't you like about him? I find it odd that people dislike him when he is always fighting for what is right. His feats may not be valid to you because you are a fanboy of Batgirl's. You do realize you have been consistently backing her against overwhelming odds, right? People obviously notice these things and that DC fetish of yours. In terms of Cap's feats, let me tell you, he accomplishes his feats because he has the heart to do so, it isn't about abilities and strength classes. Dismissing them as invalid is not the patriotic thing to do here son. Just give the veteran credit where it is due. " Knocking out Rhino with a jump kick in the nose invalid.PIS doesn't apply in battle forums..read the rules. You can discuss whether it's valid or not with Static, but what I'd really like to know, is how you propose him knocking out rhino would somehow allow him to beat Cassie. I say the fight could go either way, especially when considering Cap does not have his signature weapon for this bout. If you don't like him because of his uniform or name then that might be the case. What don't you like about him? I find it odd that people dislike him when he is always fighting for what is right. " " I say the fight could go either way, especially when considering Cap does not have his signature weapon for this bout. " I think Cassandra has the upper hand.When Cap fights good martial artists he usually just overpowers them,he's not going to be able to do that with Cassie.He has a shield but I don't see her getting hit by a richochet and she obviously has the speed to dodge him close range. @Vance Astro: Opening post mentioned this to be a strictly hand to hand fight. Which I think will play in her favor. @vuviper: Without the use of his shield in the fight? Not really as they are far and few between. But with the aid of his shield there are a lot.
" @Vance Astro: Opening post mentioned this to be a strictly hand to hand fight. "His feats may not be valid to you because you are a fanboy of Batgirl's. Jumping to conclusions isn't a very good tactic. Captain America KO'ed Hulk and Rhino is just like Black Panther holding Silver Surfer in an armbar. It's plot-induced stupidity.
" You do realize you have been consistently backing her against overwhelming odds, right? Do you realize that Captain America can't hit someone that reads physical attacks and movements like books?
" People obviously notice these things and that DC fetish of yours. My favorite character is a Marvel character. His name is Black Panther.
" In terms of Cap's feats, let me tell you, he accomplishes his feats because he has the heart to do so, it isn't about abilities and strength classes. If you believe this, you must be the most delusional Captain America fan on the face of this planet.
" Dismissing them as invalid is not the patriotic thing to do here son. Again, try to make a convincing argument, and maybe I won't humble myself with your ridiculousness.
" Just give the veteran credit where it is due. " Your WWII vet isn't as good as you think he is. P....I.....FKIN.....S rhino has been hit by SS before and didnt get knock out think before you post "
You admit you don't like him and that is the reason why you are trying to take away his feats. That basically means you admit to being bias against him and will twist the truth about what he can do. Your comparisons are also astoundingly bad, Surfer wasn't even serious when he was fighting Rhino and he didn't whack him in the nose like Captain America did. Cap is a veteran so he knows how to put folks down a lot better than Surfer does who relies on the power cosmic rather than hand to hand fighting. @vuviper: Without the use of his shield in the fight? Not really as they are far and few between. But with the aid of his shield there are a lot. " " You admit you don't like him and that is the reason why you are trying to take away his feats. That basically means you admit to being bias against him and will twist the truth about what he can do. Your comparisons are also astoundingly bad, Surfer wasn't even serious when he was fighting Rhino and he didn't whack him in the nose like Captain America did. Cap is a veteran so he knows how to put folks down a lot better than Surfer does who relies on the power cosmic rather than hand to hand fighting. " If I said that Batgirl broke Superboy's nose with a karate chop (in which she did), you'd start crying like a little girl. "Shield ones would do fine, as long as it displays his tactical abilities "
First one he sets up the fighter with the shield toss, then moves in to disarm him, all while his shield comes back to trip him up. Second one is his awareness and using a slight movement to get his shield back into play. Third one is another one of just showing his uncanny sense of his surrondings. The next three at the end of the fight he non chalatantly tosses his shield into the air, it then drops down on top of the last Hydra soldier. Last two are also ones in which he uses his tactical awareness to get out of a tough spot. Albeit with the shield. If I said that Batgirl broke Superboy's nose with a karate chop (in which she did), you'd start crying like a little girl. " First one he sets up the fighter with the shield toss, then moves in to disarm him, all while his shield comes back to trip him up. Second one is his awareness and using a slight movement to get his shield back into play. Third one is another one of just showing his uncanny sense of his surrondings. The next three at the end of the fight he non chalatantly tosses his shield into the air, it then drops down on top of the last Hydra soldier. 7) I'm sure you have seen here before, it is him meantioning why he can dodge/evade things so easily. Simply put he sees things faster than others do. (They appear slower to him) Last two are also ones in which he uses his tactical awareness to get out of a tough spot. Albeit with the shield. " Now that I think of it, the shield does give Captain America an advantage against Batgirl's move reading. She would have to watch out for that and Cap at the same time.
" @Static Shock: But sadly he does not have it in this fight =( "
Oh.... LOL. I didn't read the OP. Oh.... LOL. I didn't read the OP. " " He was posting those scans at my request "
I know. I just didn't think he was without the shield. At least you admit you go into threads completely clueless. Thanks.